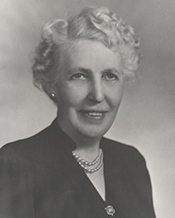 THOMPSON, Ruth, a Representative from Michigan; born in Whitehall, Muskegon County, Mich., September 15, 1887; attended the public schools; graduated from Muskegon Business College, Muskegon, Mich., 1905; lawyer, private practice; registrar of probate court of Muskegon County, Mich.; judge of probate, Muskegon County, Mich., 1925-1937; member of the Michigan state house of representatives, 1939-1941; Social Security Board, Washington, D.C., 1941-1942; staff for United States Labor Department, 1942; United States Adjutant Generals Office, 1942-1946; member and chair, Michigan state Prison Commission for Women; elected as a Republican to the Eighty-second and to the two succeeding Congresses (January 3, 1951-January 3, 1957); unsuccessful candidate for renomination to the Eighty-fifth Congress in 1956; died on April 5, 1970, in Allegan County, Mich.; interment in Oakhurst Cemetery, Whitehall, Mich.
Ruth Thompson in Women in Congress, 1917-2006. Prepared under the direction of the Committee on House Administration by the Office of History & Preservation, U. S. House of Representatives. Washington: Government Printing Office, 2006.